Lake Malawi National Park holds over 500 fish species (over 90% endemic), that make it a key example of specialized evolution. Its scientific evolution merits are on par with the Galapagos Islands. With its Rift Valley escarpment backdrop this freshwater lake also has exceptional beauty. 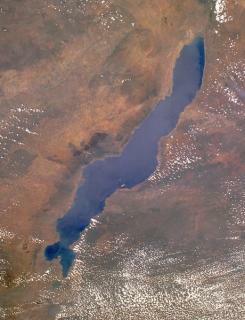 This lake is the third largest in Africa and the eighth largest lake in the world. It is also the second deepest lake in Africa. The designated area covers the southern part of Lake Malawi, including Cape Maclear Peninsula, 3 other mainland areas, 12 islands and about 7 square km of lake waters. Lake Malawi was on my safari tour so I visited this without gunning for a WHS “tick” before I started travelling more frequently. The lodges at the shore are nice but shockingly poor villages surround the luxury. After arriving I asked about scuba diving and we arranged it for the next day. The same evening I went out on a lovely modern catamaran to see the rockfish. This is one of the main criteria of the OUV and I have to say that is worth it alone (I hate the outstanding beauty criteria). The your leta you feed them which is a bit controversial, with the guide grabbing them in his palm and letting you try the same...okay anyway you must do the sunset trip. The next day I went diving with a lovely instructor form the US who is basically doing charity. That means diving is cheap and especially the courses as most of the fees go to PADI. I would definitely do a course here if you want to save a lot of money. As for the two dives, the main attraction are the catfish drawing circles into the seabed. If you are lucky you see one performing the dance else you will most definitely find the rings as well as the catfish itself. Towards the end of the dive we cleaned up fishing nets which are a big problem here. That and from what I read there are oil reserves below the lake. Supposedly, one of the first Europeans to see Lake Malawi, a Portuguese trader, said it was more like the sea and you can't argue with him when you view the lake from Cape McClear. Getting to the UNESCO designated area of the lake is a little inconvenient. The crowded "scheduled" (i.e. when they are much more than full) buses or matolas, from various towns and villages only go to Monkey Bay, which is a spread out, bustling stretch of small wood shacks housing a variety of businesses and brick huts. Like most of Malawi, people are constantly on the move, mostly on foot or on bike. I didn't fine it very inviting. The waters of the lake itself are crystal clear and I was told much work has gone into keeping it that way, though I only saw children from the village swimming off the beach. A staff member at the lodge assured me, however, it was safe to do so and the parasites are no longer a problem. It is quite easy to arrange snorkeling trips out on the lake (with a minimum of hard sell tactics) for $40 dollars and upwards depending on where you want to go. A boat will take you out to see the beautiful variety of fish that gather in the rocks just off the nearby islands as well as Otter Point at the far end of the park. (That was my favorite spot.) Most of the trips include a lunch prepared by the boatmen, featuring fresh lake fish and local vegetables. It's a great way to spend a couple of hours. Or you can rest in the shade with a beer. I'm not a biologist so I will have to take it on faith that the biological richness of the lake, and the unique nature of the species than inhabit it, merit world heritage designation. Other than that, how much time you want to spend at the lake depends on your tolerance for laid back inactivity vs. nothing to do. I spend two days at the lake and that was enough for me; others may want to hang out longer as the sunsets and starry nights are quite lovely. There is some talk that the government wants to allow developers to build a five star luxury resort just outside the national park boundary and the villagers are afraid they will be displaced and the still mostly unspoiled balance between village and tourist lodges destroyed. There are several other points on the lake (it takes up most of Malawi) outside the UNESCO designated area that are easier to get to from the capital Lilongwe and other nearby towns. These may be more "exciting" to some, with more in the way of entertainment, as the "in spots" along the huge lake tend to change every couple of years (most of the lodge staff agreed that Senga Bay is currently the destination spot on the lake, but I only had time to visit Cape McClear. Beautiful. Definitely recommend going with some guidance from a local. Have to be careful where you swim due to parasites. Went out in a boat to an island where we could see lots of small colourful fish and jump off a rock into the lake. An amazing day! Slavery: "Cape Maclear area was one focal point in the ivory and slave trade era"
Country named after them: The lake was originally named "Nyasa" by David Livingstone probably for the generic word for "Lake" in several local languages (e.g as in "Victoria Nyanza"). 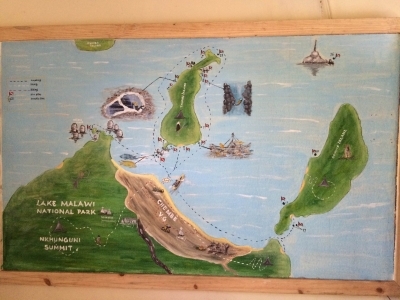 Exactly how/when/why it became changed to "Lake Malawi" is unclear. One "legend" is that "the Name derives from the native word meaning 'flaming water' or 'tongues of fire' believed to have been used to describe the dazzling reflections of its huge Lake Malawi"! Another is that Dr Hastings Banda chose it himself having seen "Lac Maravi" on an early French map of Afrique Sud (which was not however the same lake as that which became "Nyasa"). The lake was then so named by him alone and the country was named after it. A third possibility is that the country derives its name from the "Maravi", a Bantu people who came from the southern Congo about 600 years ago and that in fact the lake was renamed after it! To this day both Tanzania and Mozambique continue to call the lake "Nyasa" or "Niassa". The former possibly in order to avoid conceding Malawi's primacy in a dispute over the partition of part of the lake between the 2 countries!